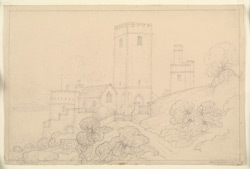 Drawing of the entrance to Dartmouth Castle. The castle is in a commanding position on the edge of the River Dart. It faces Kingswear Castle on the opposite bank of the river. It is important as the earliest surviving English coastal castle specially built for the use of guns. Built in the period 1481-c.1495 by the town corporation, it consisted of a square tower connecting to a cylindrical tower. It was altered a great deal in the following 16th and 17th centuries. There is also the church of St Petrox, right next to the castle and its west tower rises above those of the castle.